Six months have passed in my new adventure back in the northwest and the beers have not disappointed. After being inundated with San Diego’s ever changing take on the IPA, don’t get me wrong I will always love Stone Levitation, but it’s nice to be back in the PNW where craft beers of all varieties reign supreme. I am particularly pleased with the variety of amazing ambers/browns, porters and stouts. Preferring dark beers to their lighter cousins, I find that so far no other region of the country does these quite like the Northwest. The flavor quality in Rogue’s hazelnut brown is unbeatable and several other breweries have tried, but the toasted flavor of the hazelnut shines in perfect harmony with the malty flavor of this beer. As for stouts my favorite so far was found on a business trip to Portland, at the Laurelwood Brewing Co. Their award winning Space Stout lives up to the hype. It is a dark heady stout with a great pallet of chocolate malt and balanced hop combination. Not a heavy stout, it would pair well with an afternoon BBQ or a rich dessert. Not to be too biased in my love of dark beers, I throw a shout out to my favorite NW pale ale, Mannys, by Georgetown Brewing Co. This is the beer that reminded me pale ales can carry a great flavor when done right. As there are so many other great beers to try and what feels like too little time I don’t get this one as often as I would like, but at the end of a long night it’s my go to. While I’ve certainly had more than just these three beers in the last six months, there are too many to list. Moving forward I hope to give you the reader a glimpse in to the ambiance of some of the NW’s best breweries and bars and the beers that take center stage in each! BevMo! Makes the Move to Washington! With the changes in Washington state liquor laws brought on by the passing of I-1183, the doors were opened for new retailers to make their move into our fine state. One of these retailers is BevMo!, a chain with over 100 locations in both California and Arizona. I had heard of the chain when I lived down in California several years ago, but had never ventured into one of their locations (what was I thinking?!). I finally had the opportunity to see what the buzz was about when BevMo! 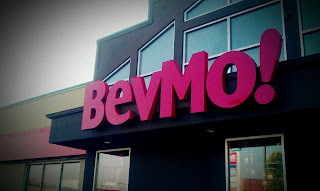 hosted several local writers and media on the “BevMo! Fun Bus” tour of their two brand new Washington stores in Tacoma and Silverdale. While I was only able to join up for the Tacoma store visit and didn’t get a chance at any of the fun bus fun, I had a great time learning about the chain, touring the store and sampling some fantastic wines.